New in our 2013 lineup is the Electra Townie, available as both a single speed and 7-speed bicycle, for those who would like to be able to traverse hilly areas in comfort. The ever-popular Townie is known for being one of the most comfortable bikes out there, and while its style has been updated for 2013, it is still as cushy a ride as ever. Electra has a patented flat-foot technology for the most ergonomic pedaling position. 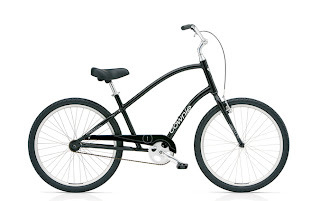 You will be seated upright on this stylish cruiser, able to enjoy the scenery as you cruise along on beach or street. Check out the array of colors and accessories available from Electra to bling out your bike. The Townie is all about personal style. Customizing this basic in-town errand and leisure bike with baskets, lights, panniers, saddles and bells heavily encouraged. Come into one of our bike shops in Louisville, Lexington, or Clarksville, IN to take one of our new 2013 bikes for a spin. 2013 Road Bike?? Cardboard? What Do You Think?